NEW YORK (CNS) — New Yorkers and tourists in Midtown Manhattan have been gazing up at a smiling Pope Francis at one of New York’s busiest intersections. 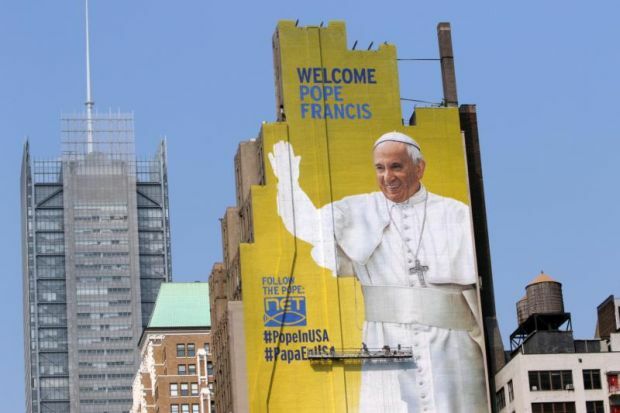 A 225-foot tall hand-painted billboard welcomes the pope, who will be in New York, Sept. 24-26. The welcoming message is located at the corner of Eighth Avenue and 34th Street, near Madison Square Garden, where the pope will celebrate Mass Sept. 25. The mural was commissioned by DeSales Media Group, the communications and technology arm of the Diocese of Brooklyn and parent company of The Tablet and NET-TV. The mural has been attracting the attention of workers and passersby. New Yorker Charles Wickliffe said the mural makes people think about religion and God. Designed by Israel Ochoa of DeSales Media, the mural showcases a photo of Pope Francis waving to a crowd taken by photographer Giulio Napolitano. The upcoming visit is already making an impression. Adina Settles, who works near Madison Square Garden, recognized Pope Francis’ face when the painters begun to color the mural. She said she hopes his presence inspires people to move beyond politics. For the four people painting the billboard, working on the likeness of the pope has been a blessing. Van Hecht-Nielsen, a parishioner of St. John the Evangelist Church in Loveland, Colorado, who has more than 10 years of experience painting billboards across the country, said he was happy to create an ad that has a deeper meaning. “People are getting excited and it is a blessing because I think it sends a message to the community,” Hecht-Nielsen said. Raising awareness about the papal visit might still be needed, according to a survey the Public Religion Research Institute released in August. The survey found that only 47 percent of respondents overall knew the pope was visiting the U.S. However, 69 percent of Catholic respondents had heard the pope is coming. The mural helped Francisco Alejandro of Columbus, Ohio, to learn about the papal visit. “I would like to learn more about it, so we can visit (New York) again,” he said. The mural includes the public hashtags #PopeInUSA and #PapaEnUSA, inviting people to engage in conversation via social media. The mural is expected to be seen by 700,000 people each week and will remain in place throughout September. Chin writes for The Tablet, newspaper of the Diocese of Brooklyn.